In continuation of a very successful series of 4 conferences in Europe and overseas, we invite you to participate in Diffusion Fundamentals V. Returning for the first time to its birthplace at the Universität Leipzig in Leipzig/Germany, the conference is scheduled for August 26–28th, 2013. Diffusion is an ubiquitous dynamic transport process that shapes structures from the molecular to macroscopic and cosmic scales. In the context of soft matter physics, we often encounter it in the form of Brownian motion. Floppy meso-structures excited by thermal noise give rise to slow complex dynamics, susceptible to weak perturbations through heterogeneities and external fields. Diffusion Fundamentals V will cover a selection out of a large range of diffusion-related topics, including fundamental aspects as well as applications. The current program includes 6 different research areas covered by outstanding international scientists. Leipzig is one of the liveliest and most dynamic cities in Germany. Whether as a musical city, trade fair Mecca or city of books – Leipzig has been an important European centers for hundreds of years. Traces of the lives of poets such as Lessing, Klopstock, or Goethe can be found throughout the city, and its philosophers Leibniz, Nietzsche and Bloch remain influential today. More recently, Leipzig was home and breeding ground to the peaceful revolution in Eastern Germany. Today’s visitors also come for the city’s modern art (“Neue Leipziger Schule”) and never fail to notice its vivid musical life, routed in a long tradition stretching back to Bach and Mendelssohn Bartholdy. As two memorable dates in the year 2013, we mention the 200th anniversaries of Richard Wagner’s birth in Leipzig and of a major battle in the Napoleonic wars, commemorated by an ascendable monument (“Völkerschlachtdenkmal”) on the battle ground. The Diffusion Fundamentals V will take place at the Physics/Chemistry campus at the Universität Leipzig south of the city center. A map of the conference site and the city center will be published at the conference website. The conference will be accompanied by an excursion including a concert at the “Alte Handelsbörse” and a tour through famous sites in Leipzig. 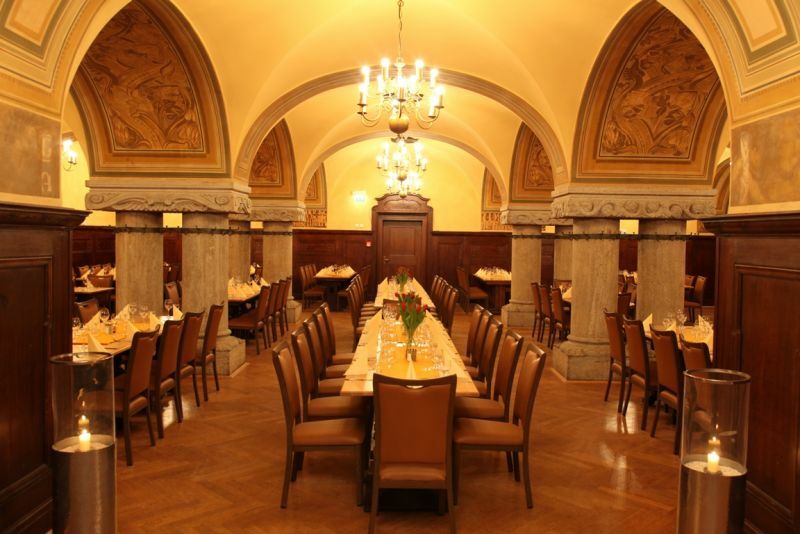 The excursion will end with the Conference Dinner at the Ratskeller Leipzig. This excursion is included in the conference fee. Please note that you need to register for this excursion. No participation is possible without registration! The city of Leipzig is situated in Saxony about 200 km to the south-west of Berlin. It is easy to reach by high-speed train from Berlin or directly via the international Airport Halle/Leipzig. It is well connected to the highway system in Germany, especially with the A9 north south route or the A14/A38/A4 east west route. Accommodation has to be directly reserved by the participants. A list of suitable hotels is available at the conference website. Early booking is highly recommended. The conference fee includes all catering during the conference comprising the Conference Dinner and the conference excursion. Please note that a participation in the conference excursion requires a registration! Registration is possible online at the conference website. If a cancellation request is received before May 31st, 2013, 100 % of the amount paid minus a handling fee of 25 € will be refunded. If a cancellation request is received before July 15th, 2013, 50 % of the amount paid will be refunded. No refund will be possible after this date. Please send your request for cancellation to Ms. Andrea Kramer. As already tradition within the Diffusion Fundamentals conference series, all contributors are welcome to submit a full length paper for publication in the Diffusion Fundamentals online journal (http://diffusion.uni-leipzig.de/). The deadline for full paper submission is November 17th, 2013. Please use the template (.tex,.doc) for submission. All submission related to the Diffusion Fundamentals V conference shall be send to Ms. Andrea Kramer.